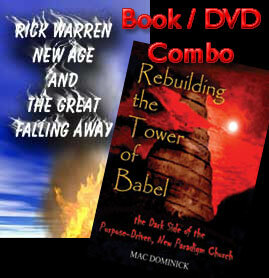 DVD, 'Rick Warren and the Great Falling Away' by Pastor Hoggard reveals the shocking truth that the foundation for Rick Warren's Purpose Driven Church is New Age Doctrine! In fact, one of Warren's major church pillars is the infamous Marilyn Ferguson's book entitled, "Aquarian Conspiracy". If your church is battling the Purpose Driven juggernaut this combination offer will provide all the information you will need to convince genuine Christians to stay far away from this movement.